The 15-year gilt yields decreased by 8 basis points and was the least volatile month of the year. After staring the month at 2.31% the yields decreased to 2.23% and was never below 2.18%. The issues with Greece continue with an expectation that a deal will be reached over the 31 billion euro bailout ater numerious delays and bridging finance and debt auctions required to avoid default. Economic figures for the Eurozone indicate the growth forecast will be cut and moody's have downgraded Frances AAA rating to AA1. Cyprus also agreed a 13 billion euro bailout with creditors with Spain's banks agreeing a 37 billion euro rescue in exchange 10,000 job cuts along with the US Fiscal cliff fears all contributed to investors keeping more of their funds in safe havens such as UK government bonds and gilts thereby increasing the price and decreasing the yield. 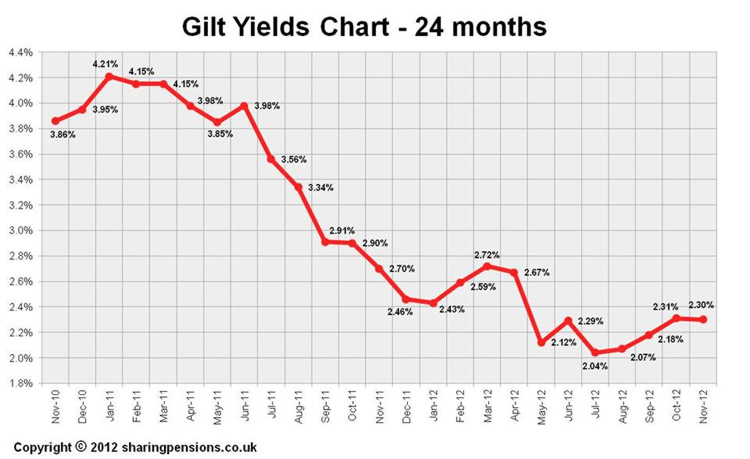 The decrease in gilt yields by 8 basis points resulted in standard annuity rates reducing by 0.86% although smoker annuity rates reduced by a greater amount of 1.55%. Although the data suggests standard annuity rates will not change in the short term and smoker annuities may increase by 0.75% although the new EU Gender Directive is likely to force annuities lower by 21 December 2012. For the latest updates see Annuity Rates Review.